I have had two books come across my desk recently that I am enjoying. I found Lyric's book while browsing in Borders. It was published in 2009 and is offered on Amazon.com. It presents a series of exercises in design that I am going to enjoy playing with. Each exercise in the book is accompanied by several examples. Lyric's writing is extremely upbeat. She spends several pages in the beginning of the book encouraging everyone to find the artist in themselves. There are some great quotes in the section too. One of the things that I find I am really enjoying about the book is are the insets in each section called "Gathering Inspiration." These passages have some wonderful suggestions for going beyond the exercises in the book. I also liked that there is a section with suggestions on how to offer critique at the end. And in the final pages Lyric critiques some of her samples used earlier in the book, pointing out that she has never made a piece she thought was perfect. All of this opens the reader's eyes to critically viewing works, both their own and others. I bought this book just before my trip to New York and read it on the plane down to New York. Probably the best illustration of the value of this book is that, even without having done any of the exercises, I realized that I was viewing so much of what I saw while walking around New York with a deeper appreciation of design elements. 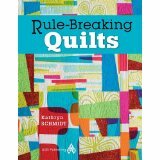 I learned about Rule Breaking Quilts on a blog and it sounded like a fun book to push my limits a bit on free form design. 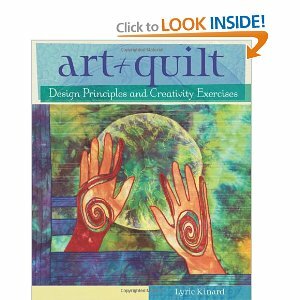 Kathryn wants people to avoid the "Quilt Police" and explore what happens when you let go of the rules of traditional quilting. She asks you to invest six fat quarters in designing an art quilt and takes off from there. Because she makes it so simple to try her approach, I am looking forward to purchasing six fat quarters in colors I love and playing with her technique and lack of rules. I suspect it will be another step in following through on my Pat Pauly workshop of a few weeks ago.